Sometimes we look for excuses not to work – but this is not one of them! A sudden clutch issue has put our tractor out of commission for a few weeks. Once the needed parts have arrived it can hopefully be put back together – as good as new! While our mechanic seems confident, it appears rather impossible to me. Guess that’s why I grow vegetables and let others fix the equipment! There are some jobs on the farm that require this tractor, and they will have to wait or simply not get done this fall. But there are plenty of other chores to keep us going. We mulched the garlic patch the other day. We prefer to do this when the ground is frozen, and before we get snow. A nice thick layer of straw protects the garlic from heaving – the freezing & thawing cycles of our winters can push the garlic right out of the ground. Straw will help maintain a more constant temperature. 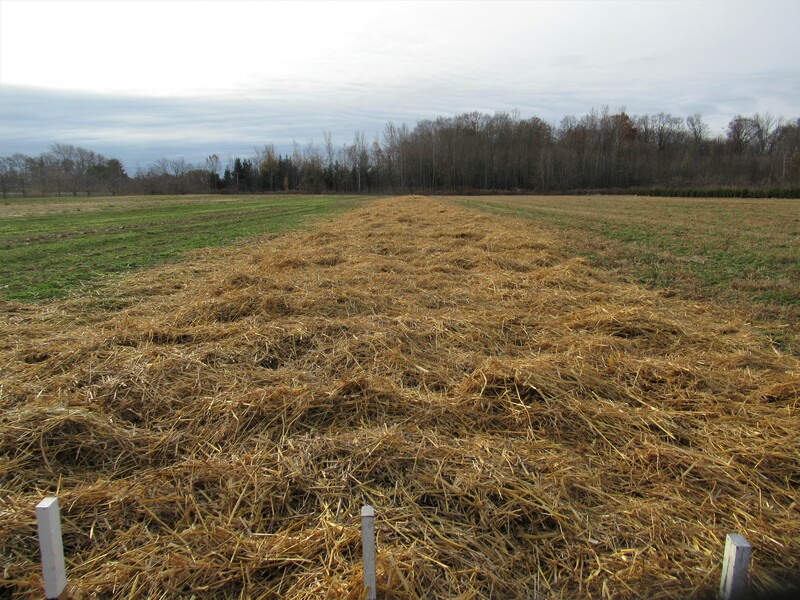 Having the ground frozen helps to discourage the mice from burrowing into the ground under the nice warm straw. The downside is that the garlic will be slow to start growing next spring as the mulch will prevent the cold soil from thawing & warming up quickly. Lastly, the straw will keep the weeds from growing next season, making the garlic patch almost care-free until harvest in July. I had just starting spreading the straw when the neighbour came by. He was also spreading straw – mulching his strawberry fields – and generously offered to do my garlic. What would have taken me about half a day with the pitchfork, took about 10 minutes with his tractor & bale shredder. Thank you to a helpful neighbour! This was our tomato field this past season. It’s all cleaned up now, like the rest of the farm. I spread a layer of leaves and grass over it. These will break down over the winter & in the spring we will work them into the soil, then spread another layer of compost and this area will be ready to plant to vegetables again. The grass & leaves come from a lawn care company that dumps them in a pile on our farm throughout the season. I try to turn the pile over a few times during the summer. 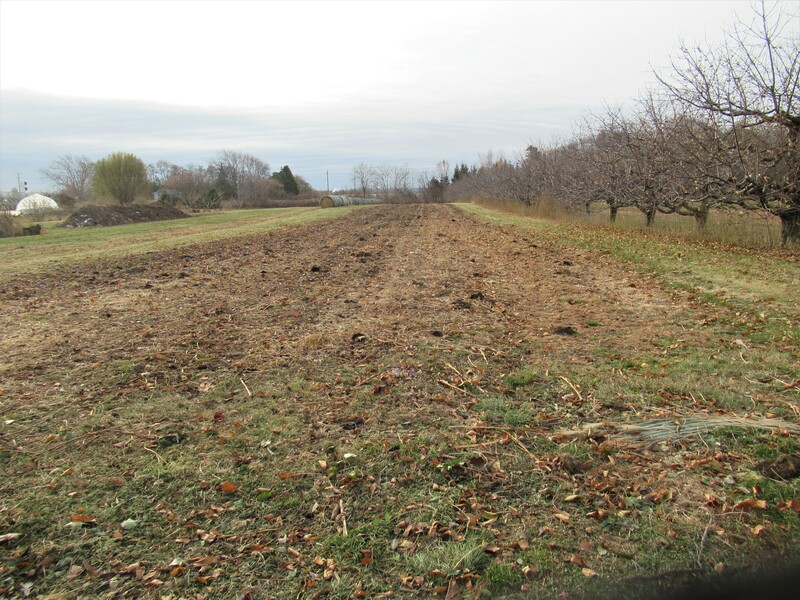 By fall much of it has decomposed and gets spread over the fields, adding beneficial organic matter & nutrients to our soil. Another pile of compost (to the left in the background of the picture) was made this spring with fresh manure, straw & leaves. It also got turned over several times this summer and is now beautiful compost that will be spread on the fields next spring. 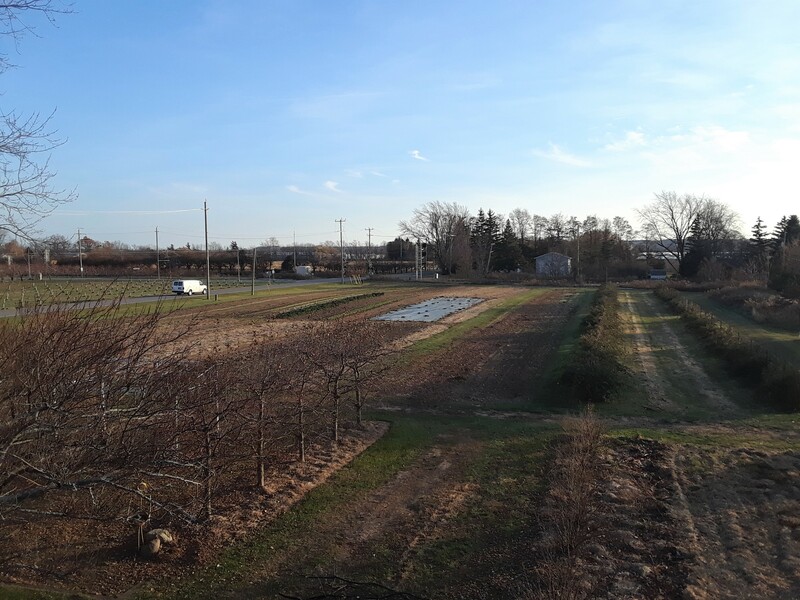 I was on the roofs of the barns yesterday cleaning the eavestroughs, so I snapped this picture – an overview of one of our fields. The light coloured rectangle in the centre is our occultation tarp (see https://thiessenfarms.com/2017/04/12/occultation/ for an explanation). That is still some kale growing to the left of the tarp – the cold weather & frosts have made it even more tasty. 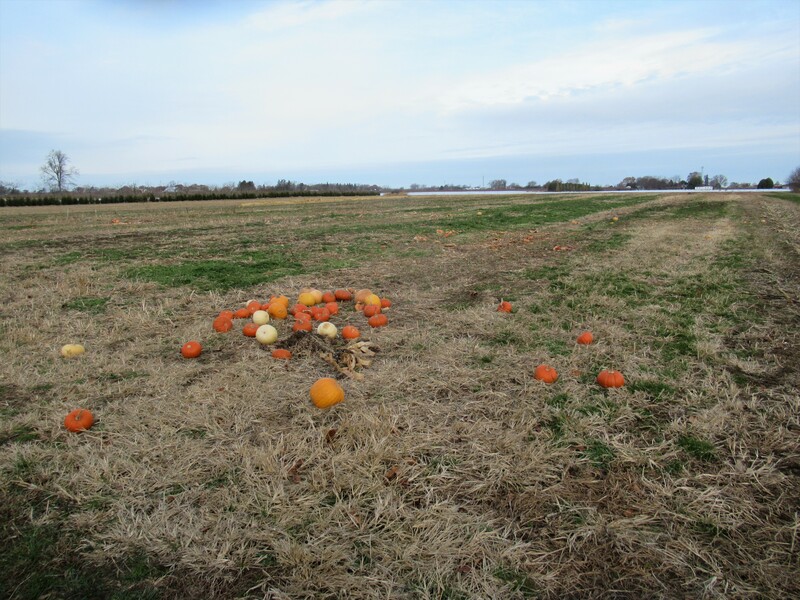 An inglorious end for the last few unsold pumpkins after Hallowe’en. 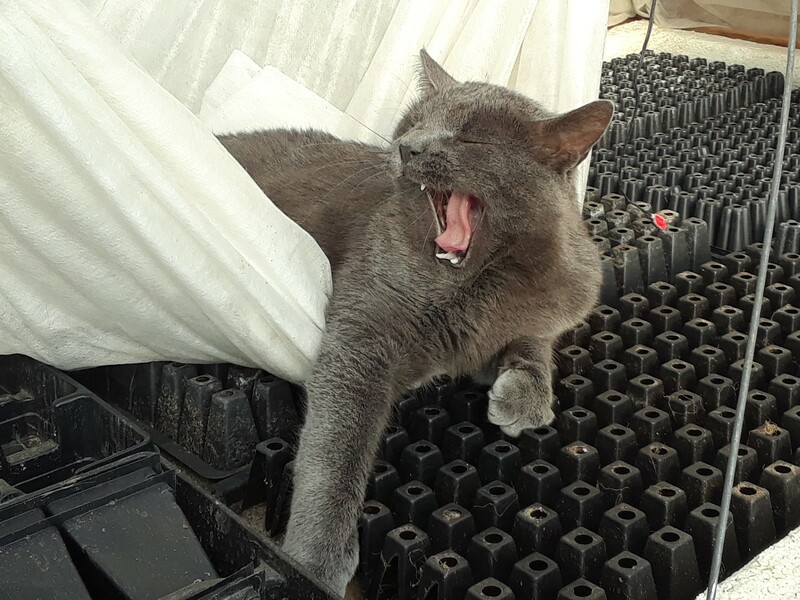 On the cold fall days the cats move into the warmth of the greenhouse. This about sums up their level of energy – and sometimes ours too!